Read Nokia 5800 XpressMusic mobile reviews, opinions, user question & answers. 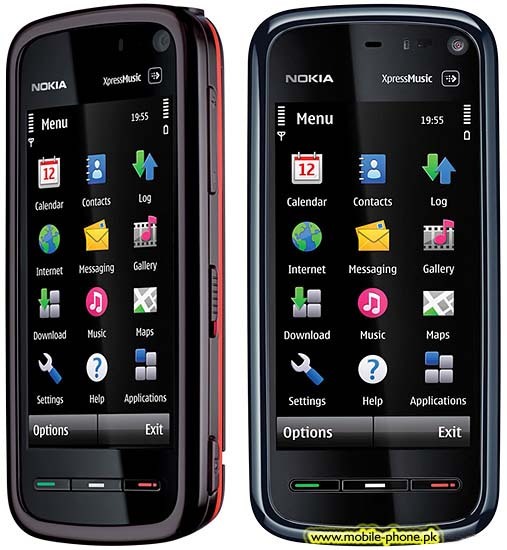 Get free Nokia 5800 XpressMusic mobile via Lucky Draw by posting Nokia 5800 XpressMusic mobile reviews and opinions. I like its speed in internet.. I want to purchase nokia 5800 express musi in used status. Please contact me at 03454498440, Lahore. Please let me tell your location, I want to see your fone. bhai mushkal hi mily ga 7-8 ki range me..
brO wht is ur demand n ap kaha pr hO ,,, ?? I want to buy Nokia 5800 XpressMusic in an excellent condition.The desired mobile should be in an ammaculate condition,sparingly used,absolutely scratchless, with all it's accessories and box with it.I will pay the market price of that mobile.My contact number is 03004800698.If someone is really interested to sell his or her same mobile,then please contact me as soon as possible.Thanks!! I want to buy Nokia 5800 XpressMusic in excellent condition. I should be in an ammaculate condition with full accessories and box with it.I mean to say, a sparingly used mobile is required.I will pay it's market price if the desired mobile really fulfills my requirements.My contact number is 03004800698. I want To buy Nokia 5800 If anyone have This Set in Good Condition Without any Fault than Do contact me ... 03219482755 thanks .. iam from lahore ..
maa chuday bas in maa k loray pathanoo ki khud to apni maa behan chodtay rehtay hain kuch kar saktay nai. hum karachi waloo ko lootoo bus sab ka yehi manshoooor hai. 5800 on sale, for just 10500 Rs. I am from Lahore and seriously i need to purchase it but i am expecting around 10k next month, December .. if you are from Lahore and you havent sold out it yet, do reply me .. . I hve lg arena For sale..5mp Specialy camera Reasult, HD video, and dolby digital sound also makin slow anf fast motion video havin fm transmetre ,accelerometre, multi touch and and like other features..
i am selliong my nokia 5800xm.. with all genuine accessories which includes( lanyard, charger, tv out cable, data cable, bluetooth hands free, wire hands free, mobile stand, pc suit cd, 8gb card, pouch). mobile condition is 8/10. those who are interested can mail me. Condition 9/10 (scaratchless and sealed set).. Original Accessories : Charger, Handsfree, 8GB memory card, Plastic Case, Silicon Protector, Stylus, TV-Output cable, Box, Books, Cd. Applications: Quickoffice, Smartmovie, Youtube, MSN Live messenger,Hotmail, Skype, Facebook, Games, Latest Themes, Google Maps, Holy Quran, Flash Apps .. etc. Which company provided the Warranty ?? muhje nokia 5800 ki dori chahiye hai jo is k sht ati hai plz agar kisi k pas hai to contect me. i want to buy a 5800 express music well condition with all accessory contact me, sms me or e mail me. i want to sell nokia 58oo if any one interested then call me or mail me. only 14000 with full specifications. I also Want to buy this but as i hear that its not gud working. Sometime it restart automatacly and multi task z also not good bcz it give low memory eror. If any one know abt this thn ply help me to lead abt ths. Thnx in advance. haris tell me the price i am also waiting if u wana sell ur mobile. mail me or call me. One of the earliest of Nokia touch screen family. Nice phone but not as good as Iphone. However Music and Camera is good and specially the 8GB card. aoa.nayyar i wana buy 5800xm in gud cndition..wat is ur selling price..
agr koi fsd main Nokia 5800 sale karna chahta ho to mujhy in no par contact karey. i used this phone for almost an year. the best thing about it is you can download millions of new software like skype nimbuzz youtube everything will be a click away. it will play both the roles of an phone and a laptop. i even used this phone for editing movies n pictures. the display and the camera n voice quality is good. Really its great, Nokia introduce a great package in nokia 5800, im using it since last 4 months, purchased from Uk. NOKIA IS THE BEST WITH SYMBIAN OS. i m thinking of buying this phone , what i m really interested to know is how smooth is the wifi and does it hang? i m already using sony ericson g700, i m quite satisfied but what i really miss is the wifi. how much better is it from g 700 ?anyone can help me decide? I used it and I just love its features.